There are around 8.2 million kids who spend at least part of their week in the care of someone else. The National Institute of Child Health Development found that a majority of daycare centers were rated as fair or poor, and only 10% provided high-quality care. Daycare is a necessity for many working families, and we want you to know what to do. Check out this guide from a Houston personal injury attorney. Before you enroll your child in a daycare, you should make sure that your child will be in a safe environment. The Texas Department of Health and Human Services has published standards online for everyone to see. It may be a good idea to look around the daycare center, and make sure that there are no hazards for your child. As part of the contract many people sign with the daycare, there is usually a clause that says that the daycare center cannot be sued. This is done as a bluff. It is nearly impossible to sign away your right to sue. These clauses almost never hold up in court. You will want to talk to a lawyer if you have any concerns about what you have signed. 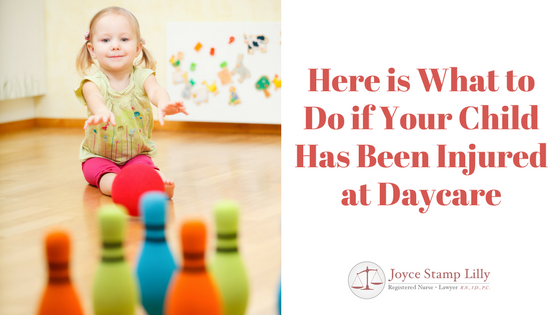 Legally speaking, the daycare center owes a duty of care to the children. This is an important part of proving negligence. You must show that this duty was breached in order to have a successful lawsuit. One of the best ways you can do this is by documenting everything that you can. As soon as you suspect that your child has been hurt at daycare, you are going to want to keep a record of everything. Write down the time and the date when you first suspected injury. The center is required to notify you in writing of the injury, and have you sign the receipt of this form. Keep this. You may also want to ask who was in charge when the accident occurred. You need to clearly understand what happened to your child. This might include keeping notes for all the conversations you have with people at the facility. Go to a doctor as soon as possible. A pediatrician will be able to tell you the extent of the injury. It may prove valuable to keep these medical records. As you go through this process, you will need to keep two things in mind. First, small children may not be able to completely articulate what is wrong with them. You will need to be patient. Secondly, not every daycare center is totally honest. You might need to do a lot of investigating and fact finding on your own. Consulting a lawyer may be a good idea. They have the expertise that you need to navigate the legal system and help you get your life back. A trip to a hospital can mean massive medical bills, which says nothing of all of the stress you may suffer. Joyce Stamp Lilly can be your Houston personal injury attorney. She is a former nurse who is ready to fight for you. If you have any questions about the steps you should take, call us at (713) 759-6430.